The US-led occupation of Iraq has exposed serious flaws in the functioning of the world's dominant war machine. While the nature of war, and the consequent taking of human life, cannot but bring out the uglier side of human nature, human rights instruments such as the Geneva Conventions were designed to mitigate, as far as possible, the extent of abuse and destruction. In the view of many, the Bush administration's flagrant disregard for such international norms has done little to further its claims of leading the “civilised world”. One of the most serious areas of fallout resulting from the Iraq war relates to the perception that now exists, that the lives of Iraqi civilians are significantly less valuable than those of coalition troops, or coalition nationals. The US Army's decision not to keep an official tally of civilian casualties was the first step in creating that perception. This sent a clear message about how seriously these losses were being taken (or not, as the case might be). General Tommy Franks, the US commander during the invasion, made matters worse by his unapologetic statement that - “We don't do body counts”. The legal and political black hole that was created by the setting up of the Guantanamo Bay facility, and the implied contempt for the rights of prisoners now termed “enemy combatants”, and therefore apparently losing entitlements to any rights! - were hard to ignore, even for the US's European allies. The prisoner abuse scandal of Abu Ghraib that shocked the world served to further harden attitudes about the apparent callousness and double standards of the occupying powers. To date, a few low-ranking soldiers have been convicted for their part in the abuse. And while an investigation against the second-ranking US intelligence officer at the jail is ongoing, his superior, Colonel Thomas Pappas, has already escaped with only a fine and a reprimand! That conviction about the lack of good faith on the part of the US military was in no way dispelled by the subsequent decision taken by the Army not to pursue charges against a Marine who shot dead an unarmed insurgent in Fallujah in November 2004…This in spite of the fact that the incident had been captured on film by an NBC cameraman, and broadcast around the world! While it has long been claimed that US troops are notorious among Iraqis, for their willingness to shoot any Iraqi in sight in the immediate aftermath of an insurgent attack, a number of recent incidents have yielded some positive proof of these claims. One such incident took place in the town of Ishaqi, where Iraqi police stated that US troops had shot dead 11 people, including five children, in their home. According to the police chief, autopsies showed that all the victims had been shot in the head. “It's a clear and perfect crime” he said (UK Independent). 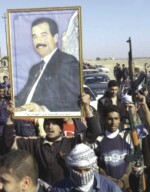 Although an American military investigation subsequently cleared US troops of rounding up and deliberately shooting those 11 people as well as blowing up the building in Ishaqi, the Iraqi government reacted furiously to the ruling and pledged to continue its own enquiries into allegations of US war crimes. “We have (heard) from more than one source that the Ishaqi killings were carried out under questionable circumstances…This report was not fair for the Iraqi people and the children who were killed” said an aide to Nuri Al-Maliki, the Prime Minister. In a similar incident, an alleged massacre took place in the town of Haditha in November 2005. The official account of what happened there centred on claims that one Marine and 15 Iraqi civilians were killed when a roadside bomb went off next to a military convoy passing through the town. It was stated that gunmen “attacked the convoy with small-arms fire” and that Marines returned the fire killing a total of nine insurgents - eight who died on the spot, and a ninth man who was wounded and died subsequently. This brought the total number of Iraqi dead to 24. However, unlike the killings at Ishaqi, the official version of events at Haditha were questioned because of eyewitness accounts by local people, as well as a video shot by an Iraqi journalism student that contradicted official claims. After an Iraqi human rights group obtained the video, it revealed that no Iraqis were killed in the bomb explosion. Furthermore, the houses where they died were bullet-riddled on the inside but had no external marks, calling into question the soldiers' claims that there had been a firefight. After Time magazine picked up the story, an infantry colonel carried out an enquiry in Haditha, concluding that 15 civilians (including women and children) had died as a result of the Marines' actions rather than the bombings. Even then however, the deaths were termed “collateral damage” an obscene euphemism for death and destruction. Meanwhile, the marines were still claiming that the nine young men who died - five in a taxi nearby, and four brothers in a nearby house - were armed fighters. These stories were effectively exposed for the lies that they were after the discovery of the horrific photographs taken of the massacre by one marine, which were found on his mobile phone. The photographs that were seized by the US Naval Criminal Investigative Service revealed that many victims were shot at close range in the head and chest, including one image of a mother and young child who lay on the floor, shot dead. Details emerging from the official investigation since then have confirmed that all the Iraqis killed were civilians, and that all the shooting that day was by the Marines. It appears that one Marine was killed by a roadside bomb, and that his colleagues then moved through the surrounding area, shooting five men standing next to a taxi, and entering a number of homes, where they continued the killing spree. According to the UK Independent, the total number of dead included six children, several women and an old man in a wheelchair. One can only conclude that they all posed a clear and present threat to the well-being of the Marines! Critics have argued that the Haditha incident might simply have been dismissed as so many others have been, if not for the graphic Iraqi documentation that found its way to Time magazine. According to Hany Khalil, a spokesperson for “United For Peace and Justice”, the fact that only relatively junior officers have been charged so far for alleged atrocities - while senior officers who also bore responsibility for putting US troops in “atrocity-producing situations” remained untouched - contributes to worsening the situation. He added, “A case has to get a huge media profile to get any attention…Iraq is supposedly a sovereign nation but the US never allowed the government any jurisdiction over US soldiers and mercenaries who are there”. The extent of the cover-up and ill intent in the Haditha case can be seen from the fact that the military initially claimed, erroneously, that the roadside bomb killed 15 of the Iraqis, and even nominated one of the Marines currently under investigation (Staff Sgt Wuterich) for a medal for bravery…! The defence lawyer for Wuterich, Kevin McDermott, has issued a barely veiled threat to the top military brass, who he claims were well aware of what had happened, but condemned it only after the matter became glaringly public. “We're going to drag every single…colonel and general into this thing…A lot of lieutenant colonels and colonels and generals knew what happened that day, and nobody said, “let's do a thorough investigation of what happened”, he said. He is not alone in this view. An unnamed general was quoted in the US press, stating that it was impossible to believe that senior commanders didn't know what had happened “You'd have to know this thing stunk” (UK Independent). These are not isolated instances. Hart Viges, who saw action in Baghdad and Fallujah, has wrenching stories of how troops were forced into impossible situations. He personally witnessed an order to open fire on all taxis in the city of Samawa because it was believed that Iraqi forces were using them!